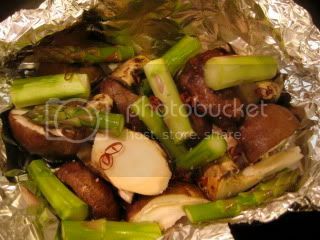 HAPPY DONABE LIFE - Mrs. Donabe's Rustic Japanese Kitchen: Donabe steam-fried foil-wrapped Matsutake etc. 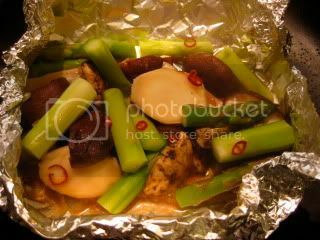 Here's my new and improved version of foil-wrapped matsutake etc., which was steam-fried in the tagine-style donabe, "Fukkura-san". This time, I seasoned the ingredients before wrapping with the foil, and cooked in the pre-heated donabe. The result was really fantastic! Here's the recipe. This is also a shojin (Buddhist-style vegan) dish. 1. Preheat "Fukkura-san" over medium-high heat for 3-5 minutes with the cover on. 2. Meanwhile, wrap all the ingredients in a large piece of aluminum foil. 3. Uncover the donabe and place the foil-wrap in the center. 4. Cover with the lid and turn down the heat to medium. 5. Cook for 8-10 minutes (you will heat the nice sizzling). Let it rest for 3 minuntes. 6. 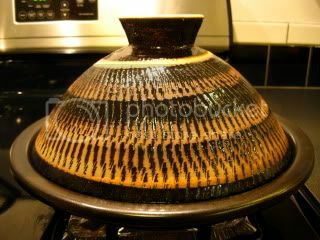 Uncover the donabe, transfer the foil-wrap to a plate, and open.